Since Foster Farms whole chickens were only $.79 /lb at Safeway, I decided to pick up a few chickens and brainstorm a few ways to prepare it. With my first chicken, I decided to roast it. 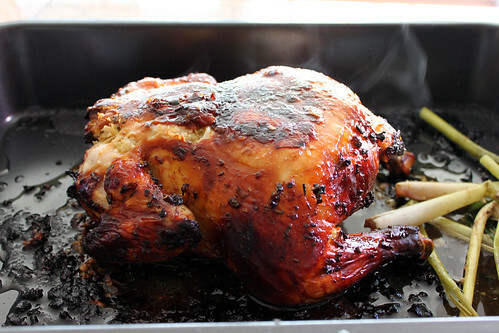 Roasting is one of the quickest and easiest method of cooking chicken. I normally just use whatever seasoning available in my pantry and create a quick dry rub, but today I decided to try something a little different and make a Vietnamese Roasted Lemongrass Chicken or in Vietnamese Gà Rô-Ti Xả and served it over a quick Egg Fried Rice. This recipe was inspired by Wandering Chopsticks blog, but I made a few changes to satisfy my palate. 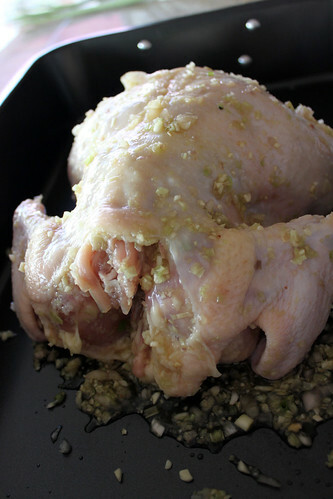 To prepare the chicken, wash and rinse the chicken under cold water and remove the goodies from inside the chicken. Pat dry. Salt the chicken. Let the chicken hang out for a few hours. In a bowl, mix Fish Sauce, Sugar, and honey until sugar is dissolved. Begin mincing 1-2 lemongrass, shallots, garlic, and scallions. After mincing is complete, combine the lemongrass, shallots, garlic, and scallions and crush it together in a mortar (or big cup) using a pestle. Combine the crushed lemongrass, shallots, garlic, and scallions to the fish sauce, sugar, and honey mixture. Marinade the inside and outside of the chicken with the lemongrass mixture. 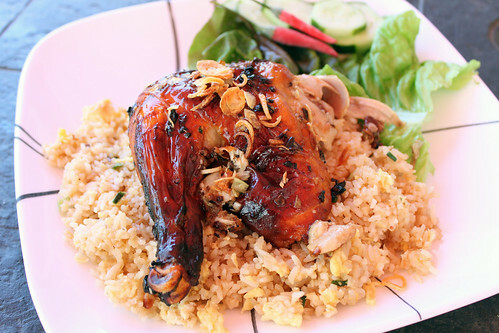 Be sure to sneak some of the lemongrass mixture under the skin and inside the cavity for maximum flavor. With the left over lemongrass stalk and scallions (green part), shove it inside the chicken. The honey from this marinade will give the chicken a beautiful skin color after it’s been roasting for awhile. Preheat the oven to 425 degrees. Once the oven is preheated, roast the chicken for 20-25 minutes. After 25 minutes or when you see the skin start turning brown, take the chicken out of the oven and flip it. Change the oven temperature to 350 degrees and roast the chicken for another 50-60 minutes or until the internal temperature of the chicken reaches 170 degrees. Once you take it out of the oven, allow the chicken to cool and settle for about 15-20 minutes before carving. Tip: If the skin begins to get too dark, simply place piece of foil over the dark skin to avoid further burning. The fried rice was made with day old rice, garlic, eggs, scallions, soy sauce, sugar, and pepper.